All FLOE vertical boat lifts are equipped with the patented Easy-Level™system. There’s no need to get wet when adjusting the lift to the perfect height and a cordless drill is all that’s needed! Simply turn the nut inside the leg to adjust the lift up or down. 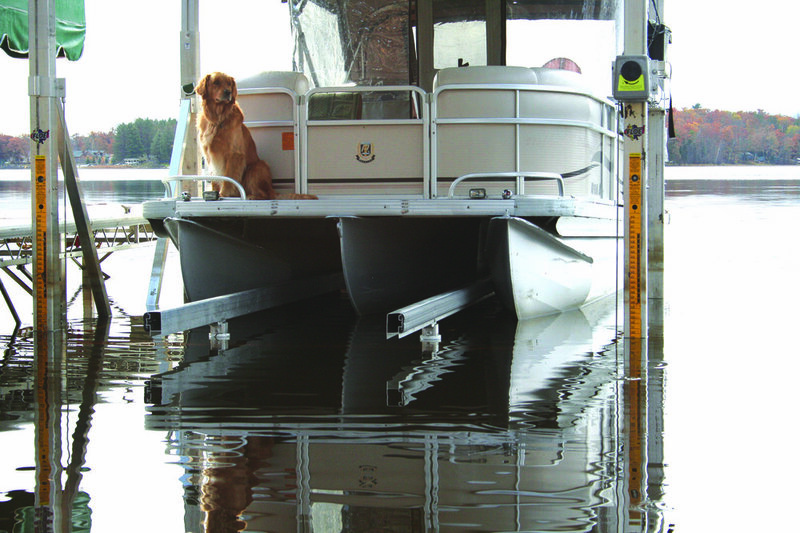 FLOE’s VSD technology raises and lowers your boat in about one-half the time of most other powered boat lifts. It is the most energy efficient boat lift in the world. The drive train is whisper quiet with no clicking winch gears or pinging cable. The low-maintenance sealed gear head electric motor simply spins the screw so that the ball nut travels back and forth as it pulls the lifting cable. The industrial strength ball-screw is rated for 20,000 cycles at 10,000 lbs.. No need to ever replace a worn winch cable with a VSD lift! 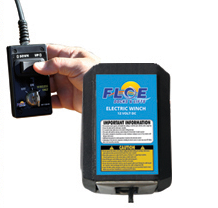 FLOE also offers custom electronic control systems for easy power and accessory connection. 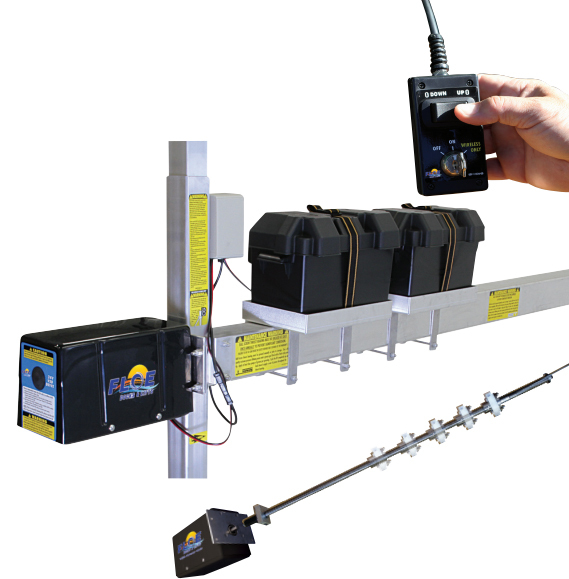 You can quickly raise and lower your boat with the push of a button on the industrial-duty wired remote with a 25-foot cord for convenient positioning or combine your lift with a wireless remote and flood/canopy light system. Add a FLOE Solar Charging panel and you’ll never need to charge your batteries. FLOE vertical boat lifts featuring electric 12-volt and manual winches are built with the same craftsmanship as the VSD lifts. Winch lifts are strong and long-lasting. FLOE’s pivot boat lifts offer a trouble-free, economical solution for small boats up to 1600 pounds. Low-friction pivot points for smooth, no-bind operation.